The Medieval Times encompass one of the most exciting periods in the History of England and Europe. The names of many famous Medieval women scatter the Medieval History books and other historical documents - they were mostly queens and princesses. But what about the women who were not of noble birth? Who were these Medieval women who became famous despite the dominance of men during this era? The following biography, short history and interesting facts provide helpful information for history courses and history coursework about the key dates and events in the life of Christine de Pizan who was famous as a Medieval author and feminist. Christine de Pazan spent the rest of her life in France. Accomplishments and Achievements or why Christine de Pizan was famous: As a Medieval author and feminist. Her books included The Book of the City of Ladies, The Book of Three Virtues and her autobiography called L'Avision de Christine. The story and biography of Christine de Pizan which contains interesting information, facts & the history about the life of this Medieval woman of historical importance. Although Christine de Pazan was born in Italy she spent most of her life in France where she received an excellent education. She was happily married to Etienne du Castel at the age of 15 and they had three children. Her husband died at the age of thirty four and Christine de Pazan became a widow tens years after her marriage. She was determined to make her own living. And she achieved this through her writing. She was highly intelligent, courageous and not afraid to speak her mind. 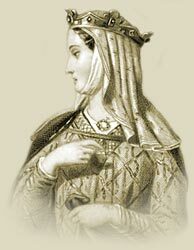 Her criticism of 'Roman de la Rose' by Jean de Meun resulted in her reputation as one of the first feminists. Interesting facts and information with a short biography about the Medieval Life, Times and history of Christine de Pizan. Additional useful details, facts, history, biography, timeline and information about the lives of other famous people of the Dark Ages and Middle Ages, and the important events which occurred during their times, can be accessed via the Medieval Life and Times Sitemap. The content of this article on Medieval life and times provides free educational details, facts and information for reference and research for schools, colleges and homework for history courses and history coursework.